Tennessee State University (TSU) is a historically black, comprehensive, four-year co-educational university located on a 500 acre campus in Nashville, Tennessee. With over 10,000 students, including nearly 1,900 graduate students, it is one of the largest historically black colleges and universities (HBCUs) in the nation. It is the only state funded HBCU in Tennessee. TSU’s history began when the Tennessee State General Assembly passed an act creating the Agricultural and Industrial State Normal School in 1909. 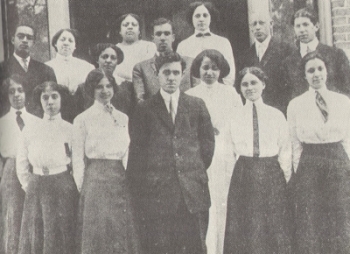 The school began serving a student body of 247 in June of 1912. In 1922 the school was raised to the status of a four-year teachers college and empowered to grant bachelor’s degrees. The first bachelor’s degrees were awarded in 1924, the same year that the school changed its name to the Agricultural and Industrial State Normal College. Three years later the word “Normal” was dropped from the name. In 1941 the Tennessee General Assembly directed the Board of Education to upgrade the educational program of the college. This included the introduction of the school’s first graduate program, in education. The first master’s degrees were awarded in 1944. Accreditation by the Southern Association of Colleges and Schools was received in 1946, and in 1951 the state Board of Education granted the school university status. In August 1958 Tennessee Agricultural and Industrial State University was elevated to full land grant university status. In 1979 the school merged with the University of Tennessee at Nashville, a formerly white institution. Today, Tennessee State University consists of five colleges (Arts & Sciences, Business, Education, Engineering, Technology, and Computer Sciences, and Health Sciences), three schools (Agriculture & Consumer Science, Nursing, and Graduate Studies & Research), and the Institute of Government. TSU’s Health Sciences program is the largest in the state and one of the largest in the nation. Fall Semester 2008 enrollment at TSU was 8,254, which included 1,823 graduate students. The student body was 74% black, 22% white, and 4% other. Those students came from 43 states and 40 foreign countries. About 75% of the students, however, were Tennessee residents. During that same term TSU had 450 full-time instructional faculty members, and 155 adjunct faculty members. The average class size was 19, and the six year graduation rate was about 45%. TSU’s university sponsored research budget exceeded $32 million in 2006, making it one of a handful of HBCUs engaged in funded research. Its most prominent alumni include Oprah Winfrey, former Tennessee congressman Harold Ford, Sr., athlete Wilma Rudolph, journalist Carl Rowan, and former National Football League star, Ed "Too Tall" Jones of the Dallas Cowboys. Tennessee State University Webpage, http://www.tnstate.edu/; Toni Hodge-Wright, The Handbook of Historically Black Colleges and Universities (Seattle: Jireh and Associates, 1992); Faustine C. Jones-Wilson, Charles A. Asbury, Margo Okazawa-Rey, D. Kamili Anderson, Sylvia M. Jacobs & Michael Fultz, Encyclopedia of African-American Education (Westport, CT: Greenwood Press, 1996).